Back in 1986 the DJ on our local imported music radio show played side one of Live in London, which I fortuitously taped and enjoyed for years. This live music is some of the finest Amon Düül II ever recorded. However, the vinyl was one of those rare and high priced collectables that I never could quite justify spending money on. Now that it has been reissued on CD I didn’t waste any time snapping it up. 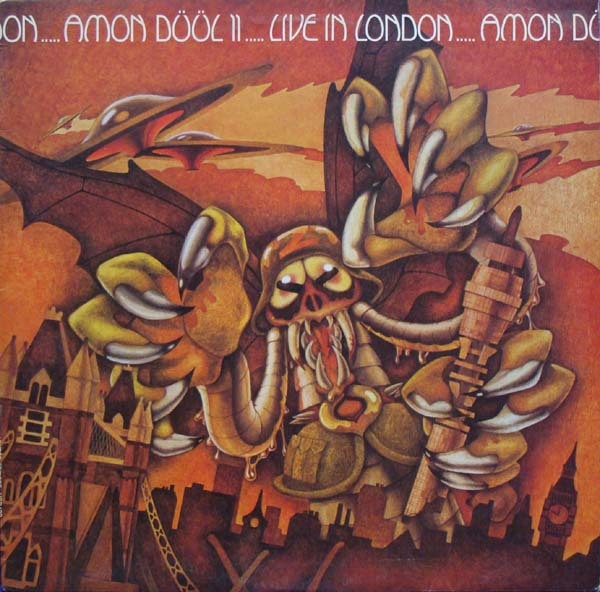 Live in London was recorded at Croydon on 16 December, 1972 and documents Dance of the Lemmings era Amon Düül II: "Archangels Thunderbird," "Eye Shaking King," "Soap Shop Rock," "Improvisations," "Syntelman’s March of the Roaring Seventies," "Landing in a Ditch," "Dehypnotized Toothpaste," "A Short Stop at the Transylvanian Brain Surgery," "Race from Here to Your Ears," "Riding on a Cloud," and "Paralized Paradise." They were in rare form that night cutting loose with extraordinary psychedelic jams and Renate’s stellar vocals. I always thought the DJ cut the track "Improvisations" short, because it seemed to end just as the band got excited. Unfortunately it does end at 3:44 minutes. The quality of the recording is above average but there is an annoying metallic ringing that is only barely evident on my tape. The harmonics from high frequency timbres such as cymbals, Renate’s voice, etc. cause the resonance to be very pronounced. This annoyance is either due to poor mike placement or an artifact of processing the tapes for reissue on CD and can be reduced by judicious signal equalizing (4000 Hz). Despite this problem Live in London is still an incredible snapshot of an exciting era in music.